How’s that for a catchy title, eh? Before I get to the cute squirrel photos, I wanted to thank Lisa and Kelly for pointing out the odd polldaddy url. It started showing up in front of posted comments. Weird. Originally I ignored it. These things tend to pop up now and then, then disappear without notice. Who am I to question why. This odd feature however refused to budge. We’re aware of this issue and our developers are working on a fix! The URL is related to the Ratings feature being enabled in comments. A recent update has broken this link. If you’d like to avoid seeing this, you can disable ratings. Otherwise, our developers are already on it! If this shows up on your own blog comments, know that a fix is under way. Now on to the cute squirrel shots. 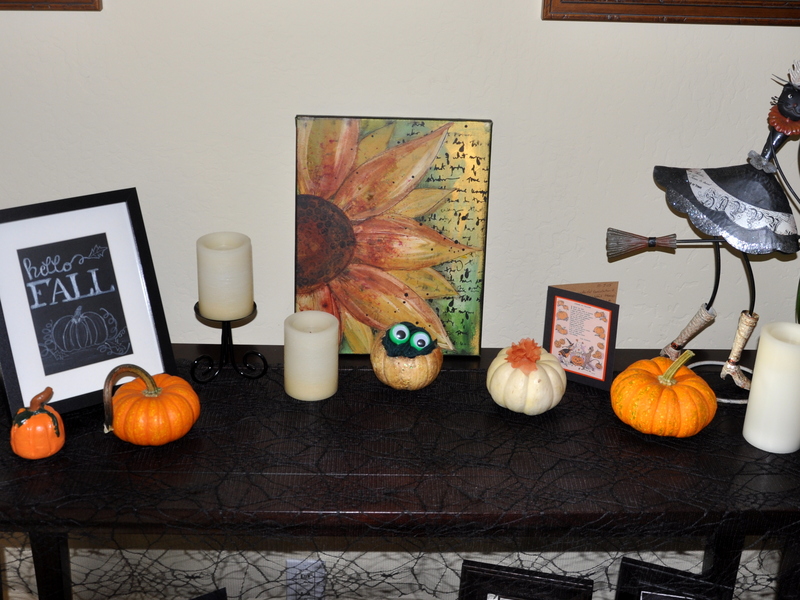 I asked one of the boys to strategically locate three tiny pumpkins from my Halloween display to the top of my garden bench. I knew the squirrels would enjoy the treat. The top of the bench gave me a front row seat to their cuteness. I love the way she/he’s holding on to the curled stem. Plump and happy, a bit like me after spending six weeks on the couch while helping myself to Hershey’s Kisses. I had my six-week follow-up with my doctor this week. She’s delighted with my progress! I am free of the cast at night, but will continue to wear the surgical boot/brace by day. I’ve also started to walk with crutches. She wants me to continue the exercises and to begin to put about 25% of my weight on the foot. It’s painful to walk, but necessary for healing, so I’m following orders and looking forward to continued healing. I’ll be on crutches for two to three weeks, and if all continues to go well, I’ll be back in real shoes by early next year. 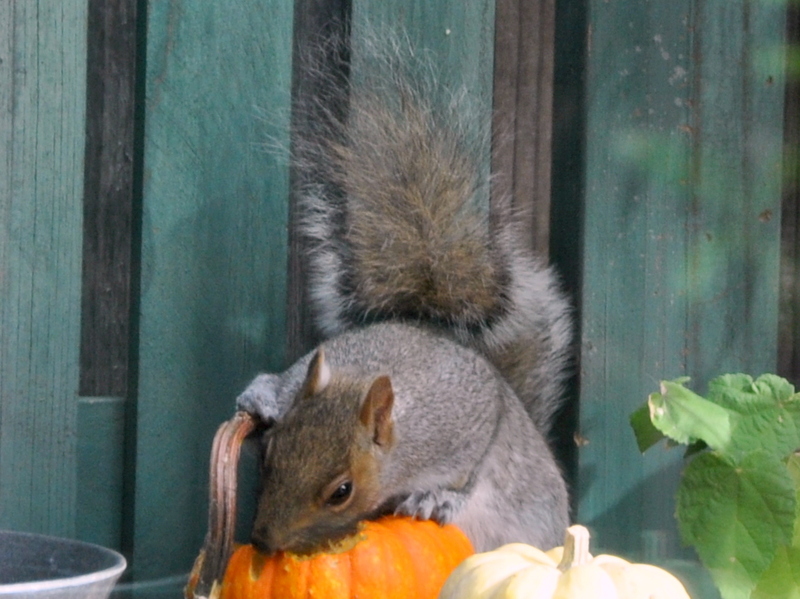 This entry was posted in Squirrels and tagged footnotes, grey squirrels, squirrels, squirrels eating pumpkins, WordPress polldaddy glitch. Bookmark the permalink. Indeed very cute squirrel pictures, and thank you so much for your feedback on the WP bug. I find it is becoming such a struggle to keep up with the changes. The changes do seem constant, especially when using multiple platforms and social media. I’m glad you liked the squirrels. I find them irresistible. It is worrisome. I’ve had the odd thing happen and quickly changed my password. Interestingly, the first person I chatted with had no idea what I was talking about. I left for a doctor’s appointment, then started a new chat later today and that’s when she shared. So it must be newly discovered. Sorry to hear about the computer problems. Sometimes it’s like dealing with a temperamental boss…or child. Yes, sometimes you have to persist and get someone who knows. But it can eat a lot of time. But meanwhile, you do have some happy squirrels! The squirrels are indeed quite happy, and although hard to see in these photos, they’ve grown plump with the season too. They’re fully ready for winter, and maybe next winter too. These things do take time to sort out and can be so tedious. Good news about your foot ~ yay to you for doing all the right things, no matter how much you wanted to push things forward! Thank you, Anne. I did a bit of walking today so I’m tired, but my foot is still attached so I’m none the worse for wear. I’m sorry to hear that your possums are destroying your vine. We have possums too, but I’ve heard your variety are much bigger. Ours mostly eat bugs and snails and don’t seem to bother the vegetation at all. The squirrels can also be destructive but I love all animals and feel we’ve encroached so much on their world. Best of luck with your vine. Can you spray it with pepper to dissuade them? Well it is good to have that polldaddy problem explained! I didn’t mention it as I assumed it was just me. I still have that sideways movement of text happening on your blog from time to time and have become so used to it happening I don’t think about it any more. Very cute squirrel photos and really good news about your foot and your healing rate – I’ll bet you are ready to go for a hike up your hills just as soon as you are given the all clear!! I’m glad your recovery is sailing by. You’ll be off to the races in no time! In the meantime, being slowed down a bit for the holidays can’t be all bad! Ogee, slowing down for the holidays has been good. I’ve also had wonderful help too, from friends taking me to appointments and to the post office, my sons when home and my wonderful husband who cooks and waits on me and helps me to and from the car. Aside from the pain and the inconvenience, I’ve had it pretty good. What a smart idea to put something out that the squirrels can’t resist and keep a camera sitting there handy. I’m sorry about the physical therapy. It’s hard to do and sometime they push too hard. Don’t let them. Easy going is always better. I’m wishing you the speediest recovery. Giant hugs. Ooos, that should read healed! I’m so pleased to hear that the cast is off and physiotherapist is underway – unpleasant, but necessary and at least you’ll be more mobile for Christmas. 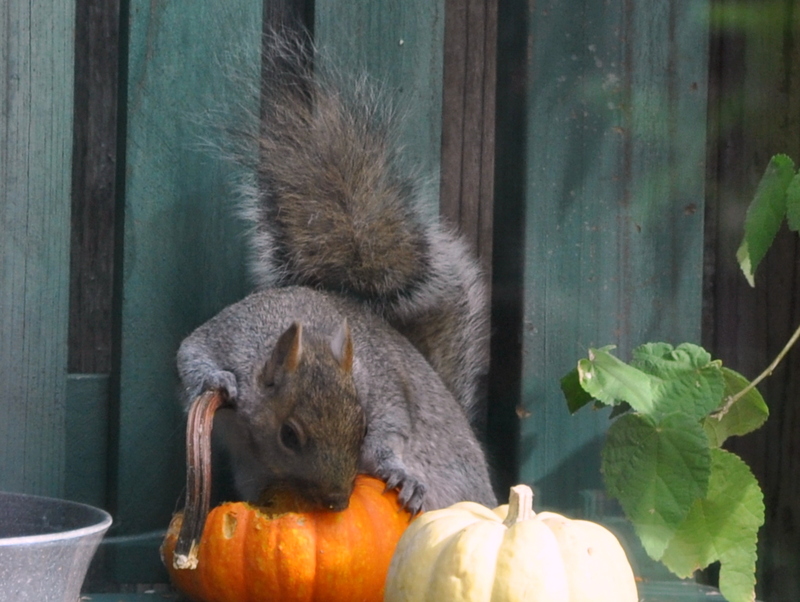 Such adorable squirrel pics, I love the cute way he is clutching the pumpkin stalk! Thank you! It feels good to be increasing my mobility each day. I attended a Christmas party over the weekend and had a really nice time. My lovely host parked me in a choice spot near the tree and friends made the rounds all night. Great fun and wonderful to be out and about. I love the squirrels! I don’t understand people who see them simply as rodents! And what good news about your healing–have you been dreaming about running and jumping and playing? I agree. I think squirrels are adorable. Honestly I should them a Christmas card with my thanks for the free entertainment all year long. Not dreaming about running, but I did dream that I was walking up a hill distributing clothes for the less fortunate. Weird dream, eh? Thank you for all your visits on this day. 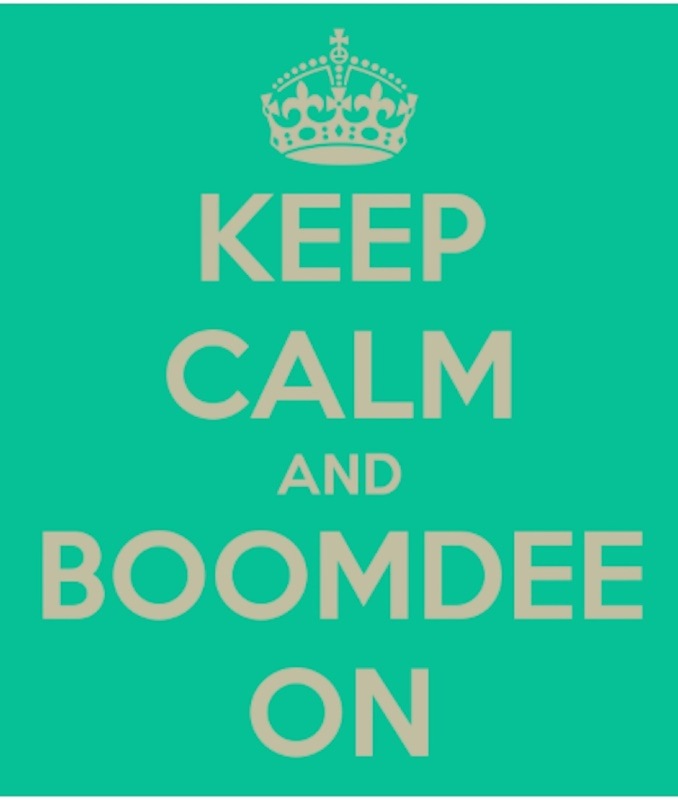 I have a nice little column of aqua Boomdee Gravatars all lined up in a pretty ribbon of you. I love how she’s holding that stem too. There little “hands” are my favorite, with that soft, bushy tale a close second. Yeah, that WP thing is still hanging around, even after I disabled ratings. Weird. At least I can stop worrying about it. The squirrels are so sweet! Delighted to hear that your recovery is going well and you’re up and about now, hopefully the pain isn’t too great. Thank you, Sheryl. The pain eases a little with each day and my energy continues to improve, too. That is such a relief. Those squirrels are cute. I find them endlessly entertaining.